The acoustic/electric Grand Auditorium 414-ce responds well to an array of playing styles thanks to Taylor’s proprietary body shape and the expansive tonal palette of ovangkol and spruce. Expect a blend of power and tonal definition, especially in the midrange, so whether you like to strum, flatpick or play fingerstyle, the 414ce makes a great playing partner. Contemporary aesthetic strokes include white binding, Italian acrylic dot fretboard inlays, a three-ring rosette, and a full-gloss body. 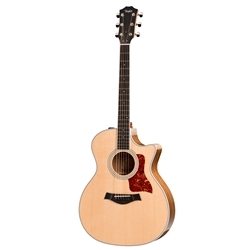 The guitar comes equipped with Taylor’s Expression System® 2 acoustic electronics along with a Venetian cutaway, and ships in a Taylor deluxe hardshell case.